This recipe for cauliflower relish calls for the use of asafoetida, or hing as it is called on the container I have. The smell of the asafoetida is not at all pleasant before cooking but once cooked there is a wonderful flavour of leeks added to the dish you use it in. This spice is considered a digestive aid and is used for pickling and is best enhanced with the use of turmeric. I am one of those people who is an accident waiting to happen. I can injure myself without having to do anything. But, my latest injury is affecting my ability to type. My ring finger is so bruised that just hitting the keyboard with it brings tears to my eyes. I thought that I had twisted it when drying my hands but I realized the other night that it is the way I sleep when on my left hand side. I have not been sleeping on that side for over a year as I injured my right knee really badly and sleeping with my knees bent made it worse. I have been sleeping on my right, with my right leg straight and my left leg slightly bent. Now that we have a puppy in the house I am actually doing more lying in bed than sleeping and I thought if I put myself into a comfort position I would fall back asleep. I followed the recommendations from my chiropractor and bent my knees and hips slightly to take pressure off my lower back. And in order to prevent me from falling onto my stomach and sleeping flat like that, I put my hands between my knees. Well, as soon as I did that I realized that I must have somehow hurt my finger in my sleep! I don’t even have a bruise to show for the pain and I am not sure how to fix it. All I know is that it has been a few weeks of this really uncomfortable feeling. When my finger was at its worst I decided to prepare easy meals and very easy side dishes. This cauliflower relish is one of them. Once overcooked, the taste and texture of cauliflower is totally ruined. This recipe results in the cauliflower being perfectly crunchy. This relish looks exactly like my nans recipe! I will have to buy some cauliflower and give it a go. I love this recipe and even have that funny spice on hand in order to make it! I love cauliflower and this sounds delicious Tandy. Sorry about your finger. Tandy, I have to be careful while sleeping due to severe lower back pain. I use a small round (or square) throw pillow and put it between my knees while I sleep on my side. It is so nice on your lower back, knees, and it will hopefully prevent your hand from hurting. Try it, I think you will like it! The cauliflower relish looks and sounds tasty. Oh man you are braver than I keeping hing in the house!! I bought it once and immediately had to toss it because Dave and I were like “ugh what IS that? ?” everytime we walked by. I’d probably love cooking with it though- I’ve had it in a ;pt pf vegetarian Indian recipes and I really like the flavor. Yay for cauliflower recipes by the way 😉 Our minds were on a similar wave-length this week. Looks great! This looks wonderful! I’d never heard of asafoetida before, I shall have to keep an eye out for it. I do love turmeric though! Yum! Ouch! I hope your finger feels better soon. I have only just got in to turmeric, so I am loving finding new ways to use it. 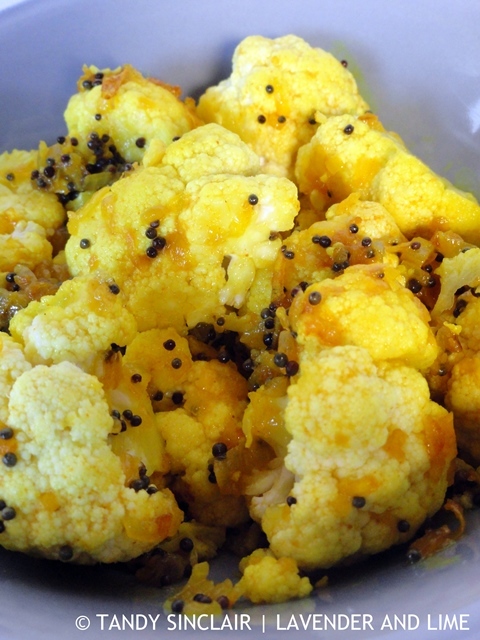 I have tried Cauliflower mixing with honey and soy sauce and I added a bit of seasem seeds! It tasted truly like heaven, hehe! Sorry to hear about your injury, Tandy. Hope you are doing well now. This cauliflower relish looks so comfy and delish, Tandy! Hi Tandy, I wonder if you some how pulled your finger out of the socket? I am accident prone myself, every year it seems I break a toe. Anyway love cauliflower, and this looks like a delicious way to enjoy it. I haven’t seen asafoetida for such a long time. We used to have a chef at the cooking school who always used it. I love this cauliflower relish – it looks so good! Hope your finger heals up soon! I’m sorry about your finger! And when you can’t sleep from an injury, that’s just the worst. =( But this cauliflower recipes looks stellar, keep making easy recipes to ease that poor finger! I am hoping my finger will heal up very soon! This sounds like a great idea for using cauliflower, perfect on the side of a curry!